ADDRESS: 219 West 7th Avenue, Tallahassee, FL 32303.Lakeview/Levy Park neighborhood, a part of west Midtown, just two blocks from North Monroe. APPLICATION: Written Application for Rental History, Employment & Income, Credit Report, etc. $50.00 (Cash or Money Order) Application Fee per Person or per Married Couple to process the Application. Application Fee is Non-Refundable. 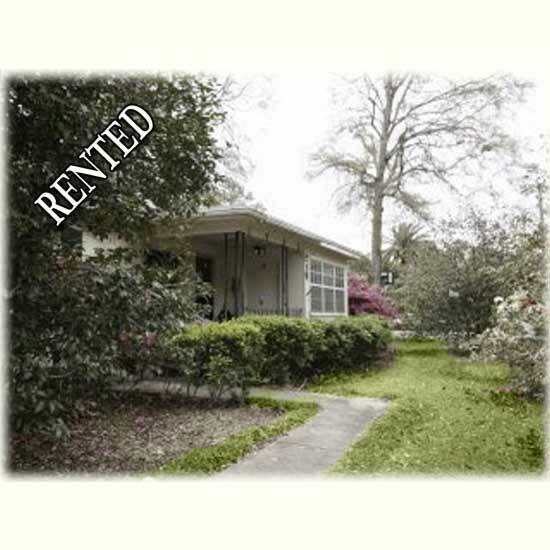 UTILITIES:Tenant pays for all the Utilities except water and sewer (these are included in the rent of $850.00); Cable TV, Internet, and Phone. Property Manager checks/changes Air Conditioning Filters Monthly. FLOOR PLAN:One half of duplex. Living room is open to dining room. Separate kitchen with updates. Hardwood floors throughout. About 1056 Sq. Ft. heated and cooled. Ample storage room with washer and dryer attached to unit. KITCHEN APPLIANCES: Range, Refrigerator w/Ice-maker and Microwave Oven. Laundry Appliances: Washer and Dryer. SECURITY DEPOSIT: $975.00. This is not the Last Month’s Rent. Property Manager visits monthly to pick up rent check and check/change the HVAC filter. PETS: May be considered, 30 pounds or under. There is a Pet Application and Interview with the Pet. Pet Fee varies with the Pet ($250.00 minimum per Pet). This is Non-Refundable. Tenant must have Tenant’s or Renter’s Insurance with a pet. PARKING: One parking spot on left side of building (right spot) and one parking spot in rear of unit. AMENITIES: Convenient to Midtown and Downtown services, restaurants and night life! Levy Park nearby. West 7th and Duval Boulevards out your front door! Content is © Copyright Joan H. Raley, 2010-2013.